Baking | Emily can bake. Today, Julia came over for the afternoon. I would love to pretend that I am a good sister/babysitter, but this story wouldn’t be as good. I woke up early to go to work, so I was really tired. Originally Beth was supposed to watch Julia, so I was asleep on the couch. Beth had to go, so she woke me up and left. Now, here’s the part where I’m not a good sister… I didn’t exactly wake up. So Julia went to the kitchen and made some food while I slept. When I woke up, there was a lovely dessert prepared in the fridge and crumbs scattering the floor. Needless to say I love my little sis and I was pleasantly surprised by the end result. I know that this recipe is creative and technically not baking, but I thought I would share because it was so sweet. It’s like extra chocolatey, pre-moistened cookies. That, my friends, is what life is all about. Frustration comes to those who dare to dream. There are set-backs, screw-ups, and failures, but what matters is perseverance. In a previous blog post I discussed why I love baking and when I started. Now I want to explain how people tend to view my goal and what I have experienced as an aspiring baker. For those of you who don’t know, my goal is to one day open an allergy specialized bakery. I want a bakery that connects people and creates joy in the community. My bakery will not be a faceless, tableless place solely created to capitalize. I want a bakery with heart. A bakery that people can come have a muffin and read Catcher in the Rye. A bakery that welcomes children and families. A bakery that makes the perfect wedding cake. I want a bakery where memories are made. Currently, I am in a communications degree at MacEwan University. I know it doesn’t exactly seem connected. But I want to do what I love and what I love is writing and baking. I decided to postpone my culinary diploma until after I finish my degree because I got a scholarship to MacEwan. I like to say that I started with my plan B. Bakeries don’t just pop up, it’s hard work and a lot of money. I decided to pursue communications to expand my skills and also so I have a way to make real money for the bakery. Usually when I tell people that in the long run I want to be a baker, not a journalist, editor, or policy writer, they tell me not to. So many times I have had people decide that in fact baking is not in my future and it’s really their decision. That baking is too much work and not enough money. But what they don’t get is that I would never be happy as a journalist, editing makes me exhausted, and policy writing is my idea of hell. I love fiction writing and baking and that all that matters. I am going to do what I love because that, my friends, is what life is about. Find something you love and work hard to make it happen, even if it means starting with your backup plan. Tell me about your dreams and how people perceive them. Picture and quote found on Pinterest. Today I want to talk about why I love baking. I have always loved ice cream, cake, chocolate, cookies, and all thing delicious (except donuts, I don’t like donuts). In addition to my love of sweets, I find baking to be an escape. I began baking when I was seven. At this point in my life, chaos was everywhere. My dad had just passed away and grief surrounded my family. Each of my siblings had their own unique way of coping, and mine soon became baking. I would bake with my Grandma and my Auntie. (For those who wonder, why not my mom? Well… she burns things.) And no, not baking in an Easy-Bake Oven, in the real thing. I usually had supervision and support; but I was also allowed to do my own thing. I found, and find, that while I am in the kitchen creating something, I am at peace. I use that time to think and reflect. Or sometimes I use that time to avoid thinking and just focus on the task I have–escaping to a place where everything is ok. I’ve heard many people say that baking is too particular, and they would rather just throw some food in a pot and call it soup, which I get. I mean baking does require some sense of how much ingredient is needed. But what they are missing is the way it all works together. I love how no matter what, if you at egg yolks to hot milk, it will thicken. If you add baking soda to dough, it will rise. Every ingredient has a purpose and it is how they all react to each other that makes the end result. 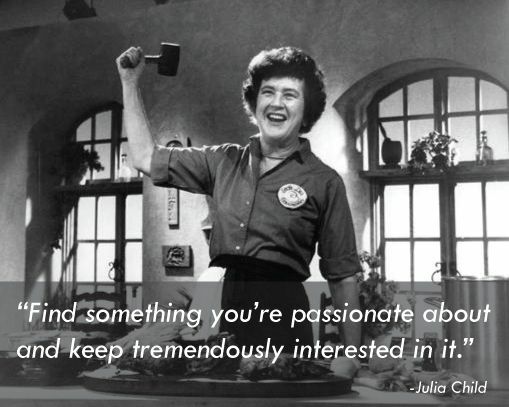 The connectivity of a recipe and how you can personally shape it to be whatever you want is what I love about baking. What helps you escape? What do you love/hate about baking? 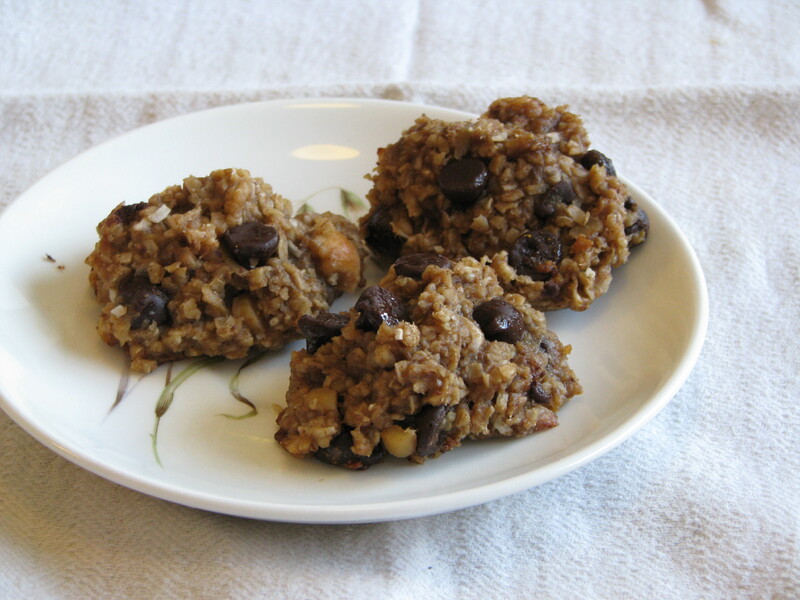 Since I started this blog, I had several people ask me for healthy baking ideas. Why? I have no clue—a balanced diet or something. Originally I was not excited to pursue this, I would rather be baking sinful, melt-in-your-mouth brownies. But I decided to look into treats that wouldn’t show up on your bathroom scale. 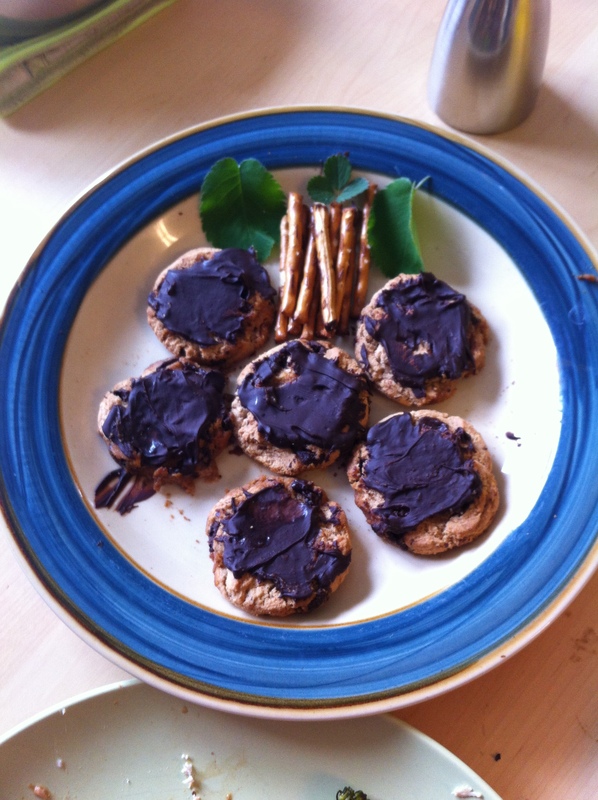 I began on pinterest and quickly found TheSkinnyFork.com, a blog with these wonderful cookies. I altered the recipe a bit, but not much; the credit really should go to Amanda Plott, for creating these magical morsels. They are lactose free, oil free, egg free, gluten free and DELICIOUS! I was concerned that you would taste the applesauce, but you definitely can’t. This is probably my new favourite recipe. Preheat the oven to 350 degrees F. Line a baking sheet with parchment paper and set aside. Mix together the bananas, nut butter, applesauce, honey, vanilla, and spices. Add in the oats, nuts, chocolate chips, and coconut; stir until well combined. Scoop rounded 2 tbsp. of the cookie dough onto baking sheet, leaving an inch or two between each and flatten slightly. Place a few more chocolate chips on top of each cookie. Bake for 20-30 minutes and allow to cool. Store in air-tight container. I have been baking since I was seven-years-old. That means I have been baking for more than half my life. I love it; but I have made my fair share of mistakes. (Shocking, I know.) One the mistakes I made the most often is leaving out the salt. I know that it has a bit of a bad reputation. And therefore you should be mindful of how much salt you’re adding to your baking, but unless you have a low sodium diet don’t omit it entirely. Salt is a key ingredient. In buttery dough, it makes it crispier, more brown, and less oily. In bread dough, it controls how much the dough rises and strengthens the elasticity of gluten. 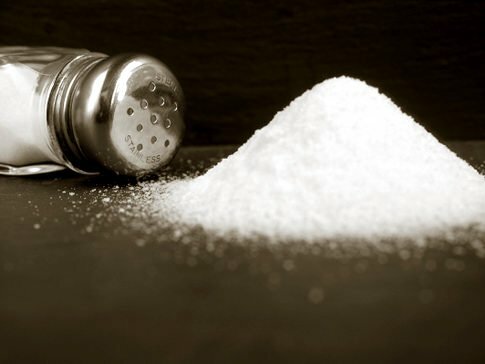 Salt also adds days of shelf life to your baking. Most importantly, it improves flavour (especially with chocolate). Salt contrasts with the sweetness to add complexity. Too sweet is not desirable; it adds balance to your baking. Salt takes your baking from meh to mouthwatering! Do you add salt to your baking? Are there any other ingredients you want to know more about? I’m thrilled to start blogging. 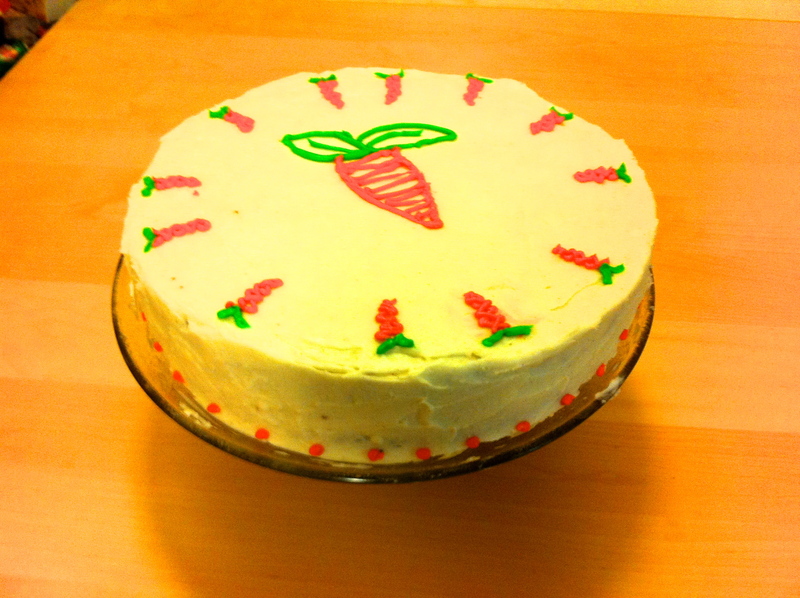 I figured I would start with one of my favourite recipes that I have been making for years, carrot cake. I originally got the recipe from the cookbook, Clueless in the Kitchen, by Evelyn Raab; however, I adapted it to be gluten free. My seven-year-old sister helped me make the cake. Although I think I could have frosted the cake better, it turned out well. And it tasted great. My brother-in-law told me he couldn’t even tell it is was gluten free. All the ingredients (except xanthan gum). 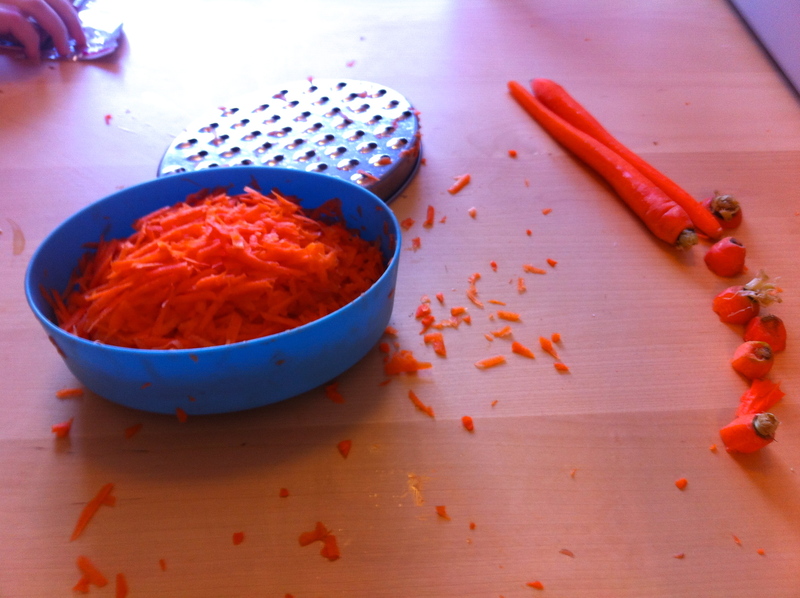 We got a little messy with the carrots. Preheat oven to 350° F. Grease two 8-inch cake pans. In a medium bowl, stir together brown rice flour, white rice flour, tapioca starch, xanthan gum, baking powder, baking soda, and cinnamon. In a large bowl, combine sugar, oil, and eggs, beating until smooth. Add the flour mixture to the egg mixture and stir. Blend the crushed pineapples in food processor or blender. Then add the carrots and crushed pineapple to batter. Mix well. Pour half the prepared batter into each pan. Bake for 35 minutes, or until a toothpick in the middle comes out clean. Remove cake from the pan and let it cool thoroughly. If you were curious, xanthan gum works in place of the gluten, making the cake stick together better. It is available at most grocery stores in the Gluten Free section. In a medium bowl, beat together all ingredients until fluffy and smooth. An electric mixer is really useful here. If the consistency is too runny, add more icing sugar. It should be thick and stick to your spoon. Frost the cake once it is entirely cool. Note: If you want to make this cake with regular wheat flour, you can. Just omit the first four ingredients (flours, starch, and gum) and use two cups of all purpose flour.